Now if you don’t know the origin of those words, you need to stop right now and go watch the movie The Sound of Music. Just make sure you have three hours of free time – it’s a long one! The next day we took the bus to the city center and got off to start exploring. 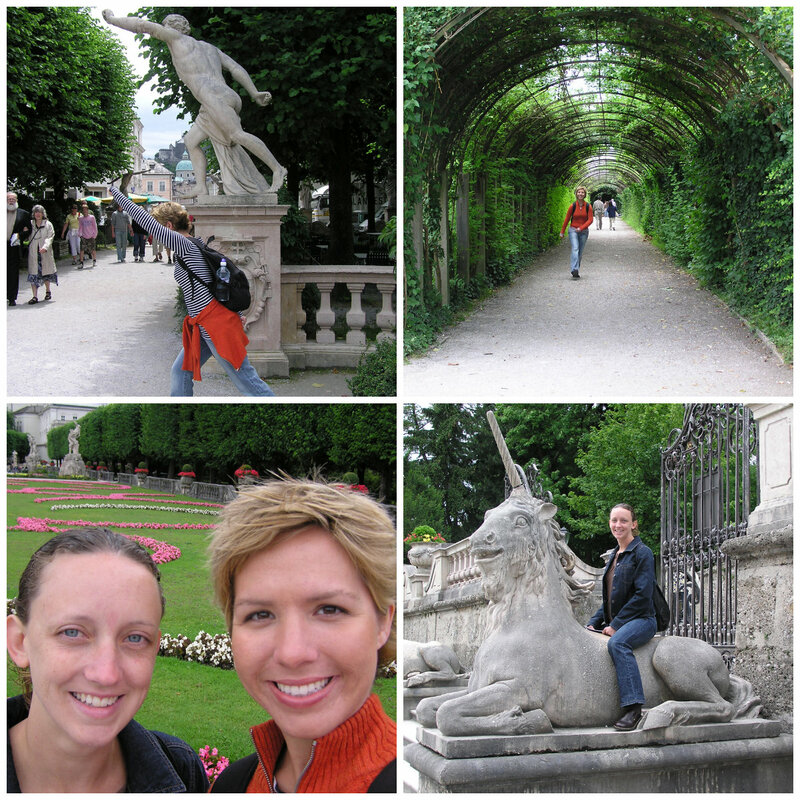 We walked to Mirabell Gardens & Palace where scenes from The Sound of Music were filmed. Recreating some movie scenes because, why not? Next we went to Mozart’s Residence and took the audio guide tour. We enjoyed hearing about Mozart and his family, listening to the music he had composed, and seeing memorabilia from his life. I took piano lessons for years growing up, and being here made me want to start playing the piano again! Leaving Mozart’s Wohnhaus, we walked toward Steingasse, which is part of the ancient Roman Road, and was used during the Middle Ages as the only way to Venice via the Alps. Walking along this narrow street, far from the city bustle, I felt like I had stepped back in time. 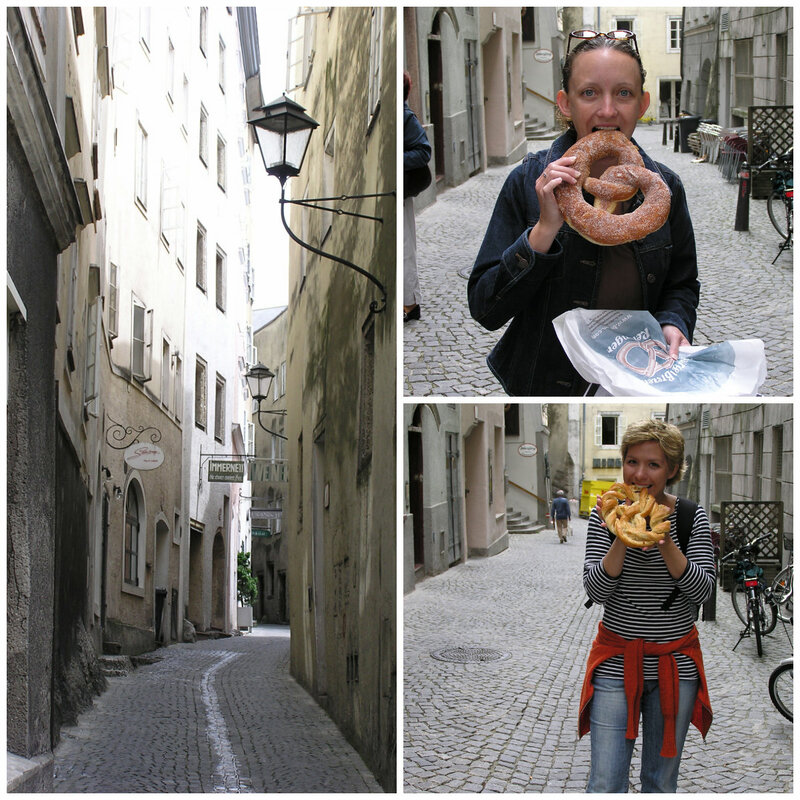 We picked up a healthy lunch (um…giant pretzels) and enjoyed strolling this historical thoroughfare. After wandering around a bit more, hopping in and out of shops, and stumbling across the Linzergassenfest Festival, we hopped on a bus and were whisked to the Untersberg cable car station. 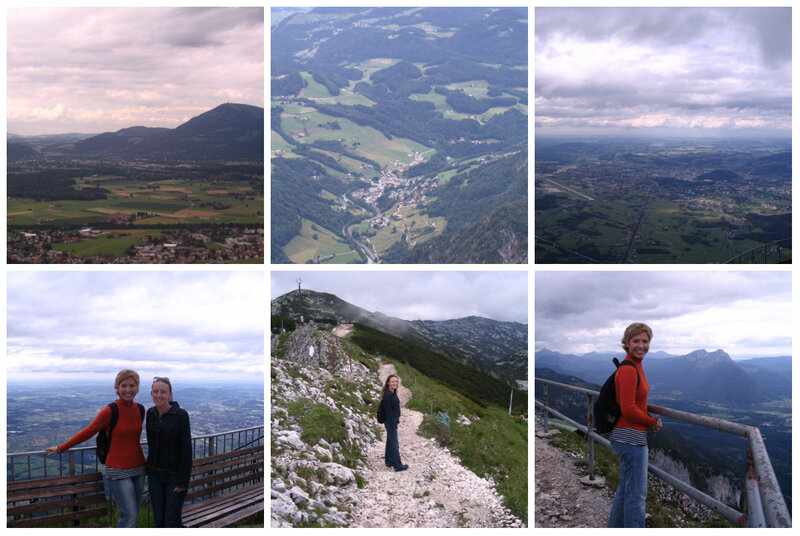 The Untersberg is one of the highest mountains near Salzburg (1853m), providing amazing, panoramic views from its peaks. There is actually a lot to do and explore on the mountain but by the time we reached the top, we only had about 45 minutes before the last departure back down to the cable car station. So we walked around, taking in the views, and thinking about the other amazing mountain peaks that were going to be awaiting us in Switzerland. I typically prefer to explore on my own and am usually not so gung-ho on group tours, but this tour (and the next one we took) was a pleasant exception. If you’re not a huge fan of the movie, you probably won’t get as much enjoyment out of this tour as we did. But even if you haven’t seen The Sound of Music, this tour still takes you to some lovely, historical and beautiful places. First stop was Leopoldskron Palace which was used as the backyard of the Von Trapp family’s home on the lake. Next was Hellbrunn Palace where the gazebo used in the movie now resides. 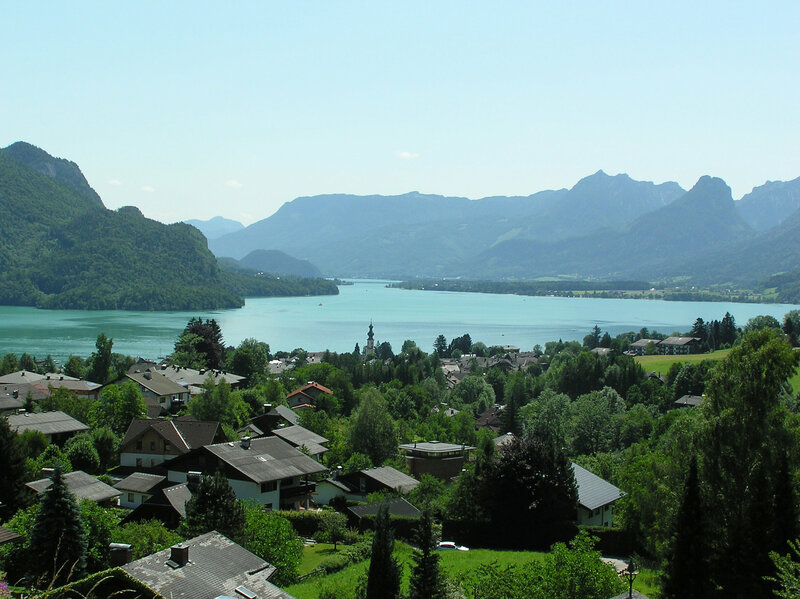 Our final stop before heading back to the city was the town of Mondsee. We were let loose for an hour to explore and grab a bite to eat. 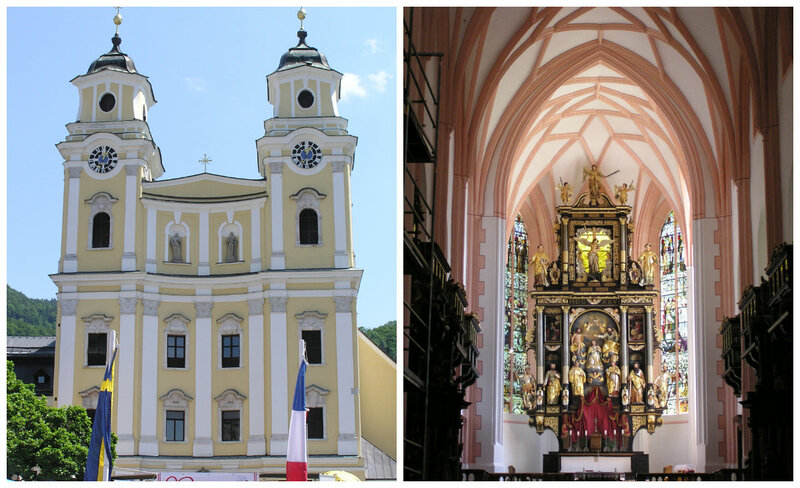 We visited the Mondsee Cathedral where the wedding of Maria and Captain Von Trapp took place in the movie. Back in Salzburg, we disembarked our bus and boarded another one for our second tour of the day: the salt mine tour. 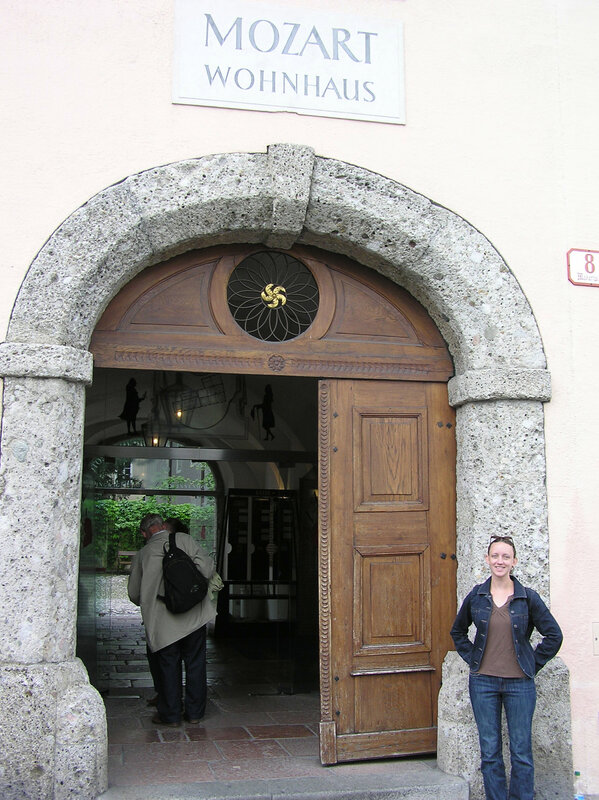 Please, if you are ever in Salzburg, you must do this tour!! This was one of the highlights of our ten weeks traveling through Europe. We started with a drive through the Bavarian mountains. SO beautiful!! Then we arrived at the Berchtesgaden Salt Mine which has been in operation since 1517. We donned traditional miner’s clothes (reminded us of something astronauts would wear) and boarded a train of sorts that took us deep into the mountain. This train tunnel was very small and quite dark – definitely not for the claustrophobic! The air got cooler and cooler as we descended and the train brought us to a huge cavern where music played and beams of light were shot across the ceiling. We then descended even further into a grotto by way of wooden slides. So fun! Our tour of the mine consisted of walking through various tunnels, going down more slides, and being educated on how salt is mined. But the best part of the tour (at least for me) was crossing the Mirror Lake (Spiegelsee). We entered a huge low-ceilinged cavern, filled almost entirely by a lake that is so still, it looks like glass reflecting the ceiling above. We boarded a flat barge/ferry and sailed across the lake smoothly and silently. It seriously felt like being in another world. Laser lights flashed, reflecting off the water, while ethereal music played. It was one of the neatest things I have ever experienced. After our journey across the lake, we all crammed into a funicular for our ride back up to daylight. We were both so glad we decided to do this tour and it is something we will never forget! 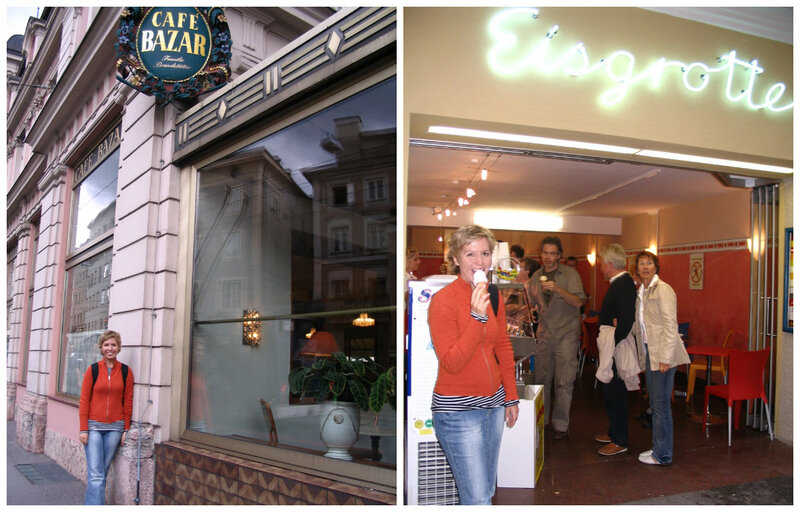 Our bus took us to the town of Berchtesgaden where we had some time to walk around and buy some ice cream (of course). Back in Salzburg, we picked up McDonald’s for dinner and ate it at the Residenzplatz. After experiencing a freak hailstorm, we headed back to our B&B for the evening. 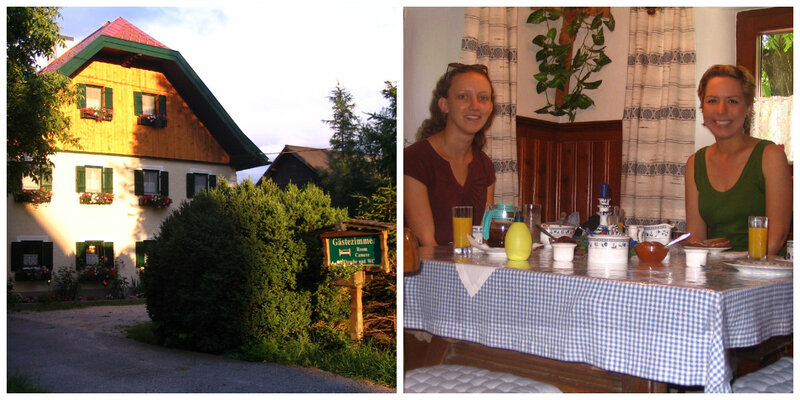 While in Salzburg, we stayed at Haus Ballwein, a bed and breakfast located outside the city. The B&B is run by a lovely lady who speaks English. Some English. 🙂 Our room actually consisted of two rooms – a bedroom and a sitting room – and had a large terrace with views of the mountains. I usually like to stay in city centers for convenience sake, but there was a bus stop right in front of the house and it was a straight, maybe 10-minute shot into the city. Breakfast was lovely each morning – Teresa tried soft-boiled eggs and hot tea for the first time. I didn’t. 🙂 Current rates for double occupancy are €58 – €68. Haus Ballwein was clean, comfortable, and reasonably priced. I highly recommend it! When we arrived in Salzburg, the first thing we did was purchase the Salzburg Card at the Tourist Information office at the train station (you can purchase them at other places, too). These cards provide admission to all the city’s attractions as well as free use of public transportation. We bought 3-day cards and used them for all of the attractions we visited including Mozart’s Residence and the Untersberg cable car. We saved quite a bit of money purchasing these as opposed to buying single tickets and bus passes. Current rates for a 3-day card are €36 – €41 (depending on the time of year). 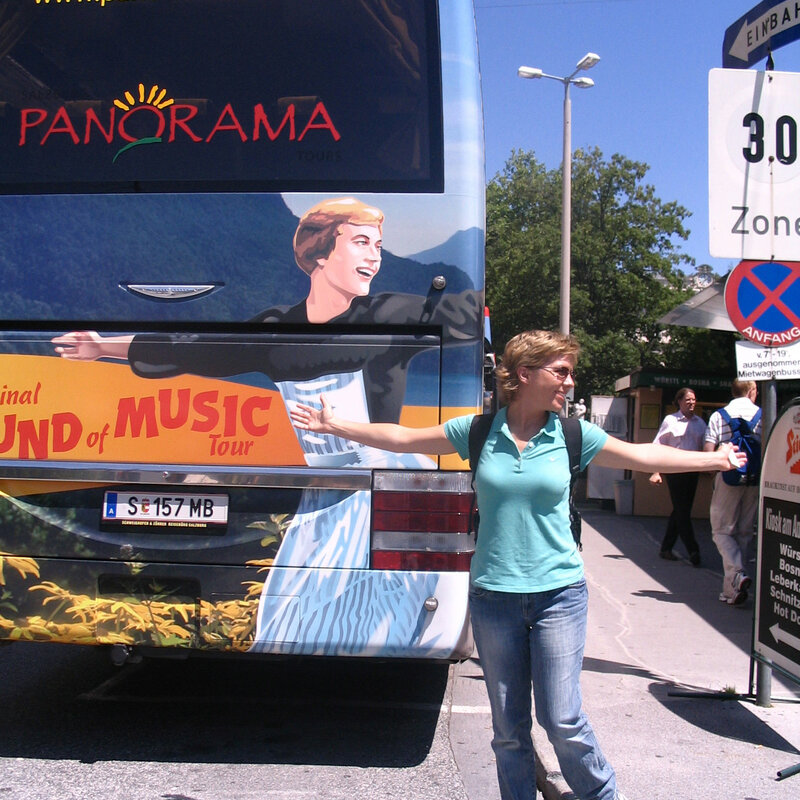 If you enjoy group or bus tours, I highly recommend Panorama Tours. Even if you don’t typically enjoy these type of tours, I would still give one of them a try. They’re a great way to get out of the city and see the surrounding countryside and mountains. Current rates for each tour is €40. We purchased a combo ticket which saved us some money. It’s Always Christmastime in Germany! Austria is one of favourite countries. It’s one of my favorites, too! I would love to explore more of the country someday.